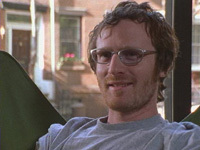 A year 2000 Oscar nominee for best animated short, this ingenious comedy introduces us to two bored roommates as they attempt to liven up just another dreary day. 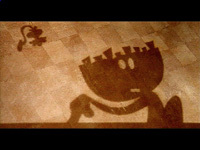 Directed by Peter Peake and produced by England's Aardman Animation Studios (Wallace & Gromit), "HumDrum" makes creative use of silhouette shadow images in presenting six and a half minutes of classic British humour (Comedy/Animated/ 6 1/2 min). 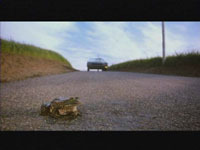 A nature-loving flower-child-man crosses paths with a disposable-plastic-loving-ultimate-consumer-90's-woman in "Frog Crossing", Director Ari Gold's environmentally-slanted Odd Couple (Comedy/12 minutes).